Dead Heading your Flowering Plants. Deadheading is performed differently depending on the type of plant. For foliage with tiny clusters of flowers it is easier to wait for the entire cluster to die. Cut the stem cleanly about one-quarter of an inch (6.4 mm) above the next group of leaves or the next cluster. Plants that generate one flower per stem, like daisies and marigolds, can be kept looking healthy by deadheading at the base of the stem. If the plant generates several flowers to a stem that bloom at different times, trim off each bloom as it dies. 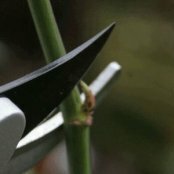 When the entire stem is through blooming, cut it back to the base. Some plants, like petunias and pansies tend to thin out if not deadheaded regularly. Trim back leggy growth and allow the plant to regenerate. Secateurs should be used when deadheading roses. Traditionally, dead blooms were removed by making a 45-degree cut just above the first outward-facing five-leaf spray. 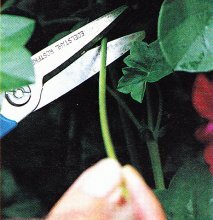 However, the current trend is to trim the bud itself and nothing more, snipping at the base of the peduncle. Some experts believe that leaving more foliage helps the plant remain stronger and encourages faster re-bloom.